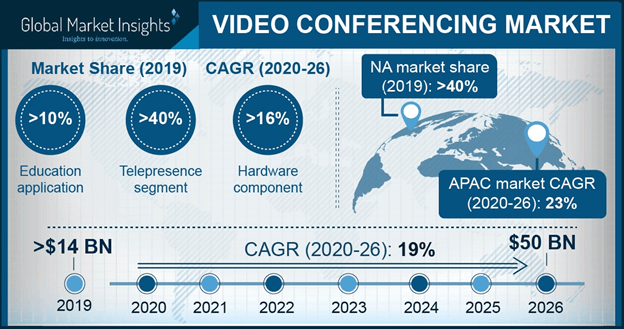 Telepresence « Global Market Insights, Inc.
Owing to the increasing availability of advanced connectivity solutions, the video conferencing market has been able to witness a rapid development in conjunction with the growing demand for communications infrastructure. Governments and various industry verticals are gradually realizing the benefits of long-distance video communication to leverage the expertise and skills of people from around the world. The video conferencing industry has enabled corporates, local authorities, academic institutes and healthcare services to expand beyond physical connections and into the virtual era. Continuous developments in technology and reducing implementation costs will propel the global video conferencing market trends in the years to come. Essentially, teleconferencing helps to establish a productive line of communication between two parties to minimize time and cost spent on traveling and to provide quicker assistance at the time of any emergency. A critical application of the video conferencing industry is in the healthcare segment, where patients residing in one part of the world can avail the services of medical professionals practicing in another section of the globe. Add to that, it also helps to connect hospital staff with doctors, suppliers, vendors of any other entity which is involved in the functioning of a facility but is located elsewhere, expanding the scope of the video conferencing market. A proof of the utility of video conferencing was recently demonstrated in Canada by the Western Hospital in Alberton, Prince Edward Island. The hospital has been conducting a six month long pilot project in which admitted patients, who do not have a family doctor, are consulted by a doctor using tele-rounding technology. Basically, hospital staff takes a cart equipped with a display monitor from patient to patient for video conferencing and the doctor would be having access to the concerned patient’s files and testing results. About half-way into the pilot, there have been nearly 1,200 consultations for about 60 patients and the hospital has records considerable reduction in duration of stay and re-admittance rate. The results of the Western Hospital pilot suggest the extensive possibilities offered by the video conferencing industry to enhance the efficiency of healthcare professionals and services as a whole. Increasing number of healthcare facilities in Canada and also in the U.S. are deploying video-call and teleconferencing systems to keep pace with the rapidly growing industry. North America, which procured a substantial proportion of the worldwide video conferencing market in 2017, has some of the most advanced healthcare systems and facilities. Initiatives taken by governments in region will further boost the adoption of video conferencing across a slew of patient care services. Expounding the focus of governments on the video conferencing industry, the U.S. Department of Agriculture will be providing up to USD 39.6 million to support the Distance Learning and Telemedicine (DLT) Grant Program. Slated to benefit over 4.5 million people in 40 states, the program will involve developing rural health care and education networks, including purchase and installation of video conferencing equipment. Citing another example to describe the significance of remote consultation to medical services, Frazer Health in British Columbia has started using video conferencing to connect cardiac patients at Abbotsford Regional Hospital and Surrey Memorial Hospital to electrophysiologists working at Royal Columbian Hospital. Speaking further, the move has helped eliminate the need for transporting a patient to another hospital for only receiving diagnosis, besides enabling faster access to treatments for irregular heartbeats or probable life threatening heart conditions. Royal Columbian is also using the technology to connect mental health patients with community teams before discharging them. Bringing healthcare and education together, the North America video conferencing market has found a novel application area in student counseling. In early November this year, Athol Hospital in Massachusetts, was granted USD 1.05 million to provide teleconferencing to students of the Ralph C. Mahar and Athol high schools via two-way video conferencing. Effectively, with an aim to bring a suitable tele-behavioral health service, the project will entail improving the performance of students in school, help them with social or emotional problems and record enhanced trials. The interminable possibilities of two-way video communication are visibly highlighted by these examples. Swift adoption of the technology across the globe will accelerate the video conferencing market expansion in the coming years, the size of which is projected to cross USD 20 billion by 2024. This entry was posted in Sustainable & Smart Technologies and tagged Cloud, Codecs, Corporate Enterprise, Desktop, Education, Global Video Conferencing Market, Government, Healthcare, MCU, Multipoint Control Unit, On-Premise, Peripheral Devices, Room Based, Telepresence, Video Conferencing Market, Video Conferencing Market Growth, Video Conferencing Market Leaders, Video Conferencing Market Share, Video Conferencing Market Size, Video Conferencing Market Trends.